In this article we explain ADSL splitters and filters – what they are and how to use them. Splitters and filters cause the most avoidable installation problems for ADSL and ADSL2 users. A filter or splitter is essential wherever a telephone or other device shares a line with an ADSL modem. Filters and splitters eliminate the high frequency noise used by ADSL services from being heard on the phones. Splitters and filters perform the same function but in two ways. A splitter divides the signal into two parts one part containing the ADSL signal and the other containing only voice. Filters block the ADSL signal and allow the voice to go through. Splitters typically have 3 labels: ADSL, Phone and Line. 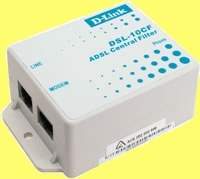 To use a splitter you connect your telephone devices (eg phone, fax or answering machine) to the connection labelled phone, your ADSL modem to the ADSL connection and the line to the wall socket. If you have other telephone wall sockets in the property on the same telephone line you will need to plug in filters between the phone and the wall socket. In addition to the user installable spliter in the photograph above, you can have a central splitter (see right) installed by a telephone technician. A central splitter is installed on the telephone line before the first phone point in the property. Thus the central splitter protects the all the phone exensions from the ADSL signal. A new phone point is wired into the central ADSL splitter specifically for the ADSL modem. The ADSL modem will not work on any other point in the property. connect the telephone devices to the filter. Just because it fits together doesn’t make it right! It is very important to read and identify the labels on splitters and filters, because the plugs and sockets can be connected in many different combinations only one of which actually works. If your phone lines look like a rat’s nest of extension cords, it can help to clean them up before trying to put the filters or splitters in place. Although it often works, it is not recommended to install your ADSL modem on a telephone extension cord.